If you’re looking for a little bit of mystery mixed with a lot of glamour, Black Onyx might be the right stone for your wedding rings. Black Onyx is a quartz and is the birthstone for Leos. It’s also the 10th wedding anniversary stone. This alluring ring is also extremely abundant, making it an affordable option for the price-conscious bride and grooms-to-be. Are you convinced that this is the stone for you? Before buying a ring embellished with this brilliant stone, it is important to be well-versed in the mineral itself and all the factors of buying an onyx embellished ring as well as ownership and upkeep. Black Onyx isn’t a very refractive ring – the bride and groom that buy this stone aren’t captivated by the ‘wow’ factor of the shine as much as they are the ‘wow’ factor of the captivating and unique color. Black Onyx is also quartz, meaning that, due to its hardness, it is a great choice for the future bride and groom that work with their hands. Rather than overwhelming you with a list of useless knowledge, we will narrow the important factors down to two simple components of Black Onyx that we find most useful to the average consumer. First, Black Onyx is a pretty resilient stone. On the hardness scale, Black Onyx finds itself at a comfortable 7, making it scratch resistant to matters that fall at a lower number than 7. To test the authenticity of your Black Onyx gem, scratch the surface with an item that is in the 1-6.5 range of the hardness scale – a fingernail, for example, sits at a low 2 – if your nail leaves a scratch on the Black Onyx, the stone you’re dealing with isn’t authentic. If you’re well versed in testing specific gravity, the specific gravity of Black Onyx is between 2.65 and 2.67. If none of that made sense to you, don’t worry, it doesn’t to the majority of consumers. A quick Google search will turn up easy to follow steps on testing for specific gravity and, if you’re unconvinced as to the authenticity of your stone, they may make for a useful experiment. Natural onyx, before it’s been dyed, will have banding in straight lines. The banding in black onyx varies. It can be brown, white or even black. The bands, and the stone itself, are created in lava. Silica is deposited into the pockets of gas that can form in lava. This gives the stone its beautiful banding. Unfortunately, not everyone is enamored of the banding in onyx. People have been dying the stone since ancient Egyptian times. To create the dyed stones, they are boiled in a sugar solution and sulphuric acid is added. While black onyx can be found in many parts of the world, there are concentrated areas where the stone is more prevalent like Mexico, Madagascar, India, Brazil, Botswana, and the U.S. The myth behind onyx is that the goddess Venus was resting one night. Cupid was feeling mischievous and uses his arrow to give the goddess a manicure. Her long nails fell into the water where they turned into onyx. The power of onyx is believed to repel negativity from your life. This could include negative people as well as negative situations. Those who wear a black onyx might see a boost of self confidence. This could be because of the properties of black onyx or the fact that it’s a beautiful stone that makes the wearer feel beautiful. It’s recommended to wear black onyx jewelry to a job interview or when asking for a raise. The power of onyx is developed over time. Those who are interested in holistic treatments find that onyx infused water can treat many ailments like sunburns, rashes and other skin problems. Feng Shui is an ancient art used in Chinese culture to decorate the home as well as places like an office. There’s believed to be an art in the placement of everything in the home from furniture to elements. For example, water is a very powerful element in Feng Shui. Color is an important part of the art, too. Black is considered a powerful color that will bring wisdom and wealth to the person who decorates with it. If possible, when decorating with black onyx, it should be used as a paperweight. Experts in Feng Shui recommend that it be used in a place where the person does their bills. It’ll keep finances weighted down symbolically. That way money doesn’t fly out of the window. While caring for your onyx jewelry won’t require much, those who believe in the properties of the stone will want to discharge the onyx once a week using running water. The energies that are used to power the stone can run dry, which means it should be regenerated. This involves burying it in earth overnight. It should be natural, outdoor soil that hasn’t been treated. It was believed that onyx had incredible protective qualities to the person that wore the stone, and that made it a valued stone among warriors and those who went into battle. Ceremonial rituals were often performed on black onyx that had been carved with the face of Hercules to give warrior even more protection as well as courage. When the stone wasn’t dyed to be completely black, it was used in some beautiful cameos throughout history. Some were so intricately carved that they could depict entire scenes like the Great Cameo of France, which is 31 cm by 26.5 cm. It’s been dated back to c. 23 AD. It can be seen the Bibliotheque Nationale in Paris. Another famous cameo is a large one from Ancient Rome that measures 12.8 cm high. It has four alternating bands featuring white and brown carving. It’s dated at approximately AD 20-50 and resides in the British Museum where it’s been since 1867. There are two “types” of Black Onyx Stones – natural and agate. Natural, as the name indicates, is found in its darkened state naturally. Agate, on the other hand, is a quartz that is dyed to achieve the dark mystifying hues of black onyx. Check out some beautiful onyx engagement rings here! Agate is the type of Black Onyx that you will typically find at the jewelry store. The color will tell you whether you’re dealing with a natural or agate stone. Natural Black Onyx stones will have imperfections in their color, displaying hues that aren’t black. Agate Black Onyx, on the other hand, will have uniformity in its color. The only enhancement Agate Black Onyx undergoes is the unnatural dying of the stone. Natural Black Onyx, on the other hand, rarely undergoes any enhancements. The all natural state of Natural Black Onyx is alluring to some customers while the uniformity of Agate Black Onyx is desired by others – as a result, whether the Black Onyx is natural or agate is a small factor in the pricing of the stone. Black Onyx isn’t a ring you need to spend too much time caring for. It isn’t harmed by heat, it’s refractivity is relatively low and, compared to many other gems and stones, it doesn’t demand meticulous cleaning. 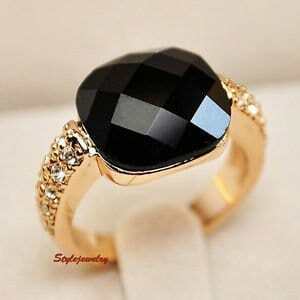 Even so, when you do clean your Black Onyx ring, it is recommended to do so with a soft cloth and warm water and soap. It is important to remember that Black Onyx can be scratched by matters that hold a hardness level of 7 or higher so it is smart to store your beautiful gem encrusted ring in a secured box, pouch, or away from any diamonds or products that may flaw the stone. As with any fine stone, it is recommended to remove your ring prior to exposing your hands to harsh household chemicals or chlorinated pools. 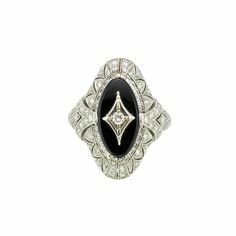 So you have your Black Onyx ring – here are some fun facts with which to wow its admirers. Medicine Men and Crystal Healers believe that Black Onyx not only reduces stress but also aids in sleeping disorders and aids the wearer in achieving a good night’s sleep. Psychics and Folk Lore both value Black Onyx for its powers of protection, even adorning soldiers with this stone before they depart for battle. Another characteristic that folk lore attributes to Black Onyx is its ability to decrease lust and tame temptation. Psychics believe that the strength of Black Onyx significantly helps in making psychic contact with the afterlife and in meditation. Black Onyx and the Bank! Due to the abundance of this stunning gem, the price to make it yours is relatively low. A loose black onyx stone is priced at approximately $9.00/carat, with the price remaining pretty stationary with the rise of the size of the stone. The value of Black Onyx, as in most other stones, will also depend on the clarity – a clear and blemish free stone will cost significantly less than one with numerous impurities. Similarly, a clean and professional cut will out value one that is irregular and imperfect. Click here for our picks for lovely black onyx rings for women! Absolutely! But we’d like to reiterate some key facts before you’re on your way. 1. This magnificent dark stone is often used as a stark and beautiful contrast to diamonds or lighter colored gems – when purchasing it with diamonds, always ensure the quality of your diamond and get a certificate of authenticity for your stones. 2. Black Onyx is a versatile ring that can be purchased in numerous cuts and accents a wide array of bands – shop around to ensure optimum satisfaction with the ring you decide to go with. 3. When buying a used or antique gem, make sure to get it inspected by a certified gemologist for imperfections that may not be visible to the naked eye. When buying a black onyx and diamond ring, be vocal in wanting certifications on the diamonds that you’re buying. An engagement ring or matching wedding set featuring black onyx is an alternative for couples who want to be original. Non-traditional choices for engagement rings are becoming more common as the ideas people have about diamonds and their sentimental value changes. The rings you choose should have special meaning to you, whether they’re made of onyx, diamond, or morganite.